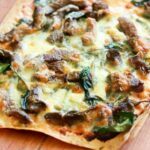 Greek lamb pizza has to be one of my favourite meals since I made the change to eat better. After cutting out most breads and pastas, this became my treat meal which my husband and I would eat on a Friday night instead of getting takeaway pizza. It is so easy to prepare and is a great one to serve to guests. The ingredients that I have listed below are to make one pizza, which is ideal for one person. To serve, drizzle the garlic yogurt over the top (as much as desired) and then squeeze the other half of the lemon on top.